Is Your Part a Fourslide Part? Click here to download this white paper (175k PDF). Manufacturers have traditionally relied on power press machines to stamp out many of their parts in large numbers at high rates – but that may be changing as the economics of production change. Not long ago manufacturers would routinely set up complex tooling, such as timed cams and benders, to perform sophisticated work on progressive power press operations, expecting the cost would amortize over the life of the product. Today, however, the trend toward greater customization, shorter product life cycles, smaller lot sizes, and higher material prices has thrown such expectations out the window. In a world where the Iomega Zip Drive was a hit one day and gone the next, manufacturers can no longer accept a typical power press tooling price of $20,000 and up as simply the cost of doing business. In a time of six-sigma quality and just-in-time delivery, they can no longer tolerate tooling lead times of six months for involved work or laborious hand adjustment after production to get specifications right. Instead, manufacturers are turning to an integrated stamping and forming operation called fourslide. 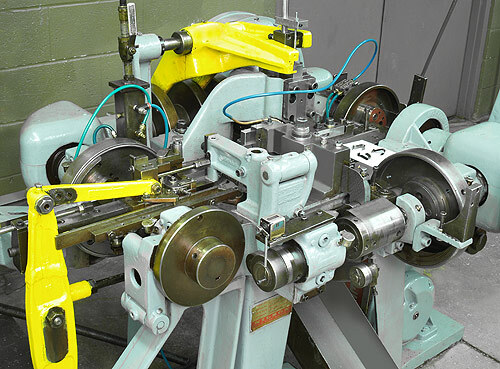 While the fourslide part making process was previously used mostly for complex work such as that with involved forming, multiple bends, or elements beyond 90-degrees, savvy manufacturers are now choosing the process over power press to slash part cost, speed product delivery, and streamline quality assurance. From precision metal stampings, flat springs, wire and ribbon forms to complex forms with multiple bends, whatever its name, if a part is stamped or formed, less than 2" and less than 0.075" thick, it may be a fourslide part. What makes the fourslide part-making process capable of cutting typical tooling costs to as little as $3,000, halving tooling lead times, and eliminating after-production adjustment to meet specifications is its unique integration of stamping and forming operations. The process begins with the raw material in flat strip form off a coil, which is stamped or blanked in the progressive die section of the fourslide machine. The strip is then fed into the forming section of the machine, where four tool carrying slides approach the part from the north, south, east, and west, forming the material around a center tool or mandrel. The set-up of the machine cams determines the sequence of tool strikes. After forming, the finished part is ejected into a parts catcher. (Click here for an animated explanation of the fourslide process). Since fourslide machines have cams and slides built into them, this eliminates the need for the costly, complex tooling of progressive power press operations. With the fourslide process, precise multiple bends, twists, tapped and threaded holes, even controlled burr direction and location can be accomplished in multiple operations before the part is ejected. Production rates up to 15,000 pieces per hour can be achieved depending on part size and complexity. Since the process typically starts with material the width of the finished part, it usually generates less scrap than power press machinery, so material costs are lower as well. In one case, a contract developer and manufacturer of precision medical parts needed to incorporate a single metal component into its product assemblies. Approximately 50,000 units per year were going to be manufactured. The company, which specializes in precision CNC machining and assembly for the medical device market, considered using the traditional method of stamping the part using a progressive die on a power press. But after evaluating the quantities and costs involved, the firm's engineers decided to use fourslide integrated stamping and forming technology. The company had never used the technique before, and it enlisted the help of Fourslide Spring & Stamping Inc. (Bristol, CT, USA). The products the company manufactures, including a variety of surgical instruments and implants, demand acute quality, timely delivery and sometimes specialised materials and alloys. "The process was attractive because the tooling is much less expensive than dies for conventional power press forming," says a spokesperson from the company. The fourslide process paid off, not only in terms of saving time and money on the front end (less than five weeks were needed from order placement to first article parts), but also on an engineering modification that required a tool change later on. The fourslide tooling modification cost less than US$1400 and took a couple of weeks to complete. A typical progressive die would have cost more and required a longer lead time. 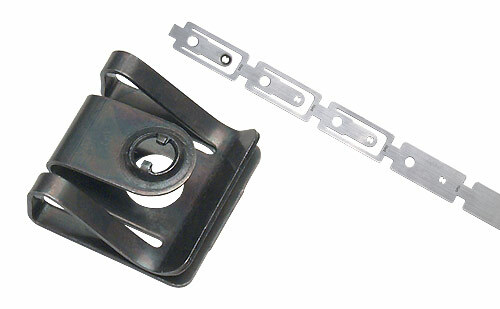 A sophisticated finished part is manufactured from metal strip. When DFCI Solutions, a manufacturer of specialty fasteners and hardware, sought to expand its European market share with the launch of several new products, typical power press machinery wasn't up to the challenge. "To get our foot in the door we needed very low prices, and to keep the business we needed very reliable product with just-in-time delivery," says John Suchopar, DFCI Solutions Plant Manager. "But power press tooling costs were exorbitant, and the lead times to construct power press dies would've taken about six months. That was unacceptable. We had to minimize upfront tooling cost especially when we weren't sure how long a particular product would last in the marketplace." Moreover, Suchopar was looking for part production that would simplify part revision and the cost of tool maintenance. "Because customer needs and market conditions constantly change, you need a cost-effective way to revise parts and maintain tooling. Power press machinery wasn't ideal because of its high up front costs and complexity to maintain. There's a lot of moving parts that wear with expensive downtime." Suchopar turned to Fourslide Spring and Stamping, Inc., a Bristol, Connecticut-based parts supplier specializing in the integrated stamping and forming parts operation called fourslide. "Because the four slides move independently along two axes, they can precisely bend and form without the complex tooling required of power press machines," says Suchopar. "Combining forming with stamping in one operation, using fourslide we saved about 75 percent in tooling costs, and about 25 percent in total part costs." The fourslide process also compressed production lead-time from a lengthy six months down to relatively short eight weeks. "Since fourslide reduces tooling cost and complexity, it has simplified part revision," adds Suchopar. "Because the process uses fewer moving parts than power press, there's less maintenance or downtime." "Fourslide has plenty of speed for our needs," says Suchopar. "We'd set a deadline and would receive part shipment a few days earlier. "Recently, we've shifted five products, including clips, brackets, and a line assembly cage, from power press machinery to the fourslide process. The way things are going, we'll be shifting plenty more." To strengthen its position with customers and boost its competitive edge, Control Products, Inc., a manufacturer of thermal and waterproof switches, aimed to streamline its quality assurance process and hold down prices despite rising material costs. Material memory was a challenge because stock had to be properly straightened from rolls so it wouldn't spring back. "Every lot of material presented a problem in consistently holding an angle or two on production parts," explains Glenn Heimroth, Control Products Quality Assurance Manager. "The parts weren't complex, but assuring accuracy was critical." One customer, for instance, required a switch to actuate every time a flat spring was depressed 0.5" within a certain tolerance. "If the springs were inconsistent, we had to adjust our finished goods by hand, which was time-consuming and expensive," says Heimroth. Power press equipment was proving too inaccurate and costly on a number of vendor supplied parts and in-house operations. A vendor using power press equipment, for example, had trouble maintaining the proper angles on latches. Thus, snapping interlocking parts together was difficult due to incorrect alignment. In search of a solution, the company turned to the fourslide process. "We now get the parts consistently right, on time, at lower cost," says Craig Morse, Control Products' Purchasing Manager. "Rather than relying on outside power press vendors or maintaining older dies in-house, we're shifting some high-volume work to fourslide." According to Heimroth and Morse, the vendor supplying the fourslide parts, Fourslide Spring and Stamping, Inc., helped to resolve a number of quality assurance and cost issues. Because of the increased accuracy and operational flexibility of the fourslide parts, for instance, the tooling for right and left-handed covers and brackets was combined in the same tool, effectively saving the cost of an entire tool. The process has also reduced material scrap. "Like a lot of manufacturers, we're trying to focus on what we do best," says Morse. "For us that's manufacturing switches, not parts for them." To further lower part cost, mitigate escalating material costs, and streamline inventory management, the vendor allowed Control Products to buy in bulk and schedule needed shipments over a two-year contract period. "In spite of rising material costs, Fourslide Spring and Stamping, Inc. has helped us hold the line on price while improving quality and delivery," concludes Morse. "It's helped us expand our business. For anyone having trouble keeping prices down, getting consistent parts, or maintaining tooling, switching to fourslide can be cost effective. That's true whether you're dealing with involved forms or simple power press operations." Fourslide Spring and Stamping, Inc. is an ISO 9001:2000 certified manufacturer of spring and wire products including precision flat springs, metal stampings, contacts, wire forms, and more for a wide range of medical, electrical, automotive, aerospace, military, consumer and industrial applications. This article has appeared in several publications, including: Metal Forming Magazine; American Tool, Die & Stamping News; Canadian Metalworking; Canadian Industrial Machining; and National Tooling & Machining Record.